Decorative lighting includes Wall Sconces, Chandeliers, Flush Mounts, Semi-Flush Mounts and Pendants. The proper combinations of these five elements insure an interesting, attractive lighting design for any room. Using different elements of lighting is called layering. Many layers of light make the difference between an OK room and WOW room. Wall Sconces placed midway on the wall can be used to balance overhead lighting and add a thoughtful dimension to your decor. The eye-level spread of light along a wall helps create an intimate ambiance in rooms and halls. As accent pieces, sconces can be used to flank architectural features, such as fireplaces and archways. In bedrooms sconces can be mounted on each side of the bed to serve as reading lights. While it is not necessary to match sconces to the style of overhead fixtures, keeping them within the same finish family will add continuity to the overall design. I actually like to combine modern and traditional styles in the same room to add a little pizzazz. A sconce’s light source, not necessarily the back plate, should be mounted between 65″ – 68″ above the floor. 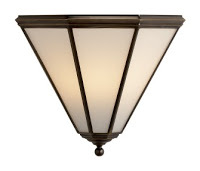 Some sconces are linear and the back plate is either higher or lower than the actual light source. In these cases the electrical junction box must be located in the proper position on the wall to enable the light source to be at the proper height. Some scones have a narrow back plate and require a narrow junction box, called a switch box, rather than the junction boxes that most electricians routinely install. Please be sure to keep these facts in mind to avoid disappointment during the installation phase of your project. Please visit http://www.fogglighting.com and like us on Facebook. I am always available for consultations on lighting plans.